Heat your smoker and put in 25 g (0.88 oz) of hickory wood chips. Place the frozen shrimp on the rack and smoke for 10-15 minutes until the shrimp is browned. Take off the shrimp and cool them, then refrigerate until cold. Chop the dill very fine and add to the mayonnaise. Refrigerate the mayonnaise until serving. Press and fold the dough gently and shape it into 2 logs. Cut the bread into 1 cm cubes. Melt the butter and dip the cubes in it. Put the cubes on a baking tray and bake in the oven at 175° C (347 degrees Fahrenheit) for 7 minutes or until crisp. Take out some of the inner leaves of the lettuce and set them aside for decoration. Chop the lettuce and dress it with the mustard and dill mayonnaise. 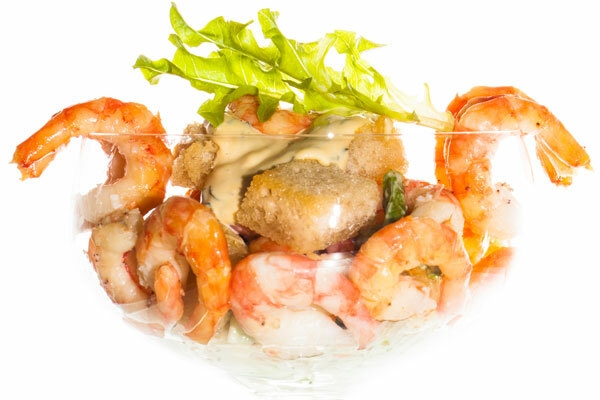 Fill martini glasses with the dressed lettuce, croutons and shrimp. Top with the small lettuce leaves.